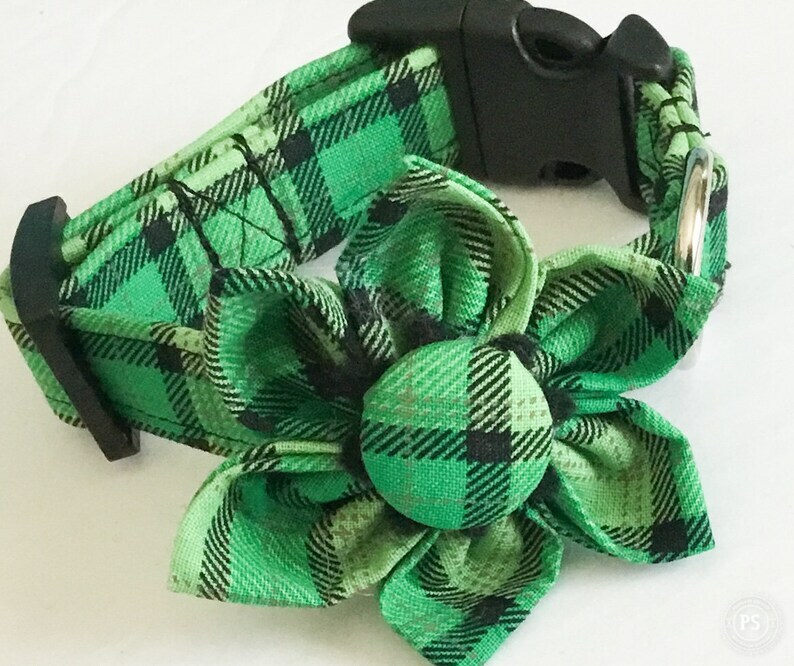 This St. Patrick’s Day Green and Black Plaid Flower Collar is cute for both male dogs or cats on this special holiday. The St. Patrick’s Day Collar with Flower can be made in both a buckled or a martingale style. Cat’s will receive breakaway collar hardware and a bell if a cat collar is selected. A matching 5 ft leash and metal collar hardware can be purchased as upgrades in the options when ordering. The flower attaches to the collar by way of wraparound velcro which has been added to the back of the bow tie. The velcro is additionally supported by felt for longer lasting strength and durability for the bow tie. All of my collars and bow ties are custom made and are available in any size or fabric of your choosing in my shop. Please contact me if you are looking for a particular color which I do not have on my site as I would be happy to custom make one for you in any fabric of your choosing. All collar are made out of durable cotton fabric and cotton blends, interfacing, medium weight webbing, heavy duty collar hardware, and reinforced stitching which gives these collars the strength and durability needed for your dogs daily activities and play during the day. All collars are adjustable. Each collars individually custom made upon ordering and can be made in all sizes including XXS, XS, S, M, L, XL with option width sizes of 3/8 inches for toy dogs and cats, 5/8 inches, 3/4 inches, 1 inch and 1.5 inches. Cats receive breakaway collar hardware for safety purposes unless otherwise requested. Please measure your dog or cats neck prior to ordering to ensure a correct fit. Please either use a soft measuring tape or a string when measuring. If using a string, place string around the neck where collar normally sits placing two fingers underneath as this allows extra space so the collar will not fit too snugly. When measuring with a measuring tape, follow the same procedure..
M- Fits neck sizes 12"-19"
LG- Fits neck sizes 15"-24"
Each collar can be machine washed on cold water delicate, however, I recommend hand washing to prevent breakage of the hardware. Do not dry in the dryer. Lay flat to dry.